The Brandeis Library supports teaching and learning across campus. 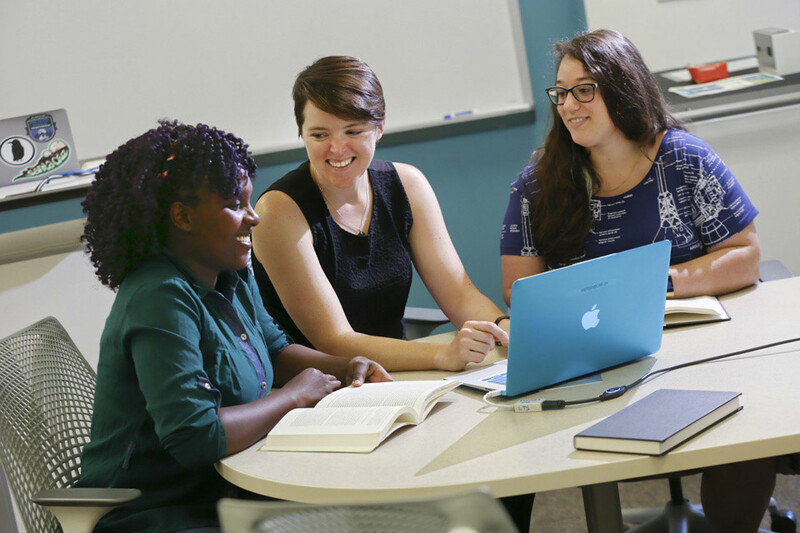 We work with faculty to help students develop skills in research and information literacy, digital literacy, data analysis, and more. A librarian can provide provide research and information literacy instruction for your students. Contact your subject liaison librarian to discuss learning goals for your class. The Library has several hundred databases — your students might not know where to start their research. Our research guides provide tips and recommended resources for research in different academic disciplines and can be a great portal to the library for your students. Contact your subject liaison librarian to discuss research guides and other instructional materials for your students. The Library provides Information Literacy Grants for faculty who are interested in incorporating information literacy skills into their teaching. Want to incorporate a new (digital) project into your class? Is there an assignment or unit you want to revamp or make more engaging? Esther Brandon, the Digital Literacy Specialist, can help you brainstorm, develop curriculum, host class workshops, or anything in between. We have resources and tools to teach students everything from website creation to non-linear storytelling to virtual reality creation! Email Esther at brandone@brandeis.edu or make an appointment. Data Analysis can be overwhelming. Margarita Corral, Data Analysis Specialist, is happy to help your students navigate the process of finding, cleaning, analyzing, and presenting data. Margarita can help you create instructional materials that guide students along this process (research guides, handouts). Margarita can come to your class to demonstrate how to use specific software that students can use in their quantitative and qualitative research projects (Stata, SPSS, Excel, R, and Atlas.ti). Email Margarita at mcorral@brandeis.edu or make an appointment. Are you interested in geographic information systems (GIS) but aren’t sure where to start? Alex Willett, GIS & Social Sciences Librarian, can provide course-integrated instruction sessions, individual and group consultations, and follow-up GIS support to assist you and your students with developing stronger data and spatial literacies through the use of GIS. Learn how to create maps, explore the spatial relationships of data sets, and so much more. Email Alex at awillett@brandeis.edu or make an appointment. The staff at University Archives & Special Collections is excited to work with any faculty member to plan and design instruction sessions using the original primary source materials available here at Brandeis. To learn more about our collections, check out our research guide of materials organized by subject. Please email Chloe Morse-Harding, Reference and Instruction Archivist, with questions or to set up a planning session. If you are interested in integrating digital media assignments into one of your classes, please contact Mark Dellelo, manager of the library’s media labs and studios. Mark can talk to you about the resources available for your students to use in producing videos, audio recordings, photos, and graphics. He is also available to help you design assignments on a practical scale and to teach workshops attached to your class. The MakerLab is a place where faculty, students, staff, researchers and other Brandeis community members can come to 3D Print, 3D Scan, or otherwise rapid-prototype electronics with rentable gear, step-by-step guides, and back-end equipment. Contact Ian Roy) to learn more. Information Literacy Grants: These grants are meant to help faculty work with librarians to design courses that help students become mature researchers and scholars. Affordable and Open Educational Resource Grants: To address the high costs of textbooks and other academic resources, the Library funds grants for faculty who are interested in incorporating open and affordable educational resources into their courses. Staff members from the Library, Center for Teaching & Learning, and Rabb School provide support to grant recipients on the development of course materials. Brandeis Library offers workshops and sessions on citation management, research strategies, data analysis and management, GIS, software for quantitative and qualitative analysis, subject-specific resources, media services, 3D printing, soldering and more. View a complete list of upcoming workshops. Course Reserves are books, videos and other materials that faculty members and instructors set aside for class reading and course work. We encourage faculty members and instructors to place all required course materials on reserve to ensure that these high demand items are available to all of your students. Are you looking to refresh your syllabus with new readings and films? Your librarian would be happy to help you locate potential course materials to bring in new voices or perspectives to your class. College is expensive before buying textbooks. Your librarian can also work with you to identify ways to reduce textbook costs for your students through the use of open educational resources, multiple-user e-books, and materials available through the Library.